Cory Tyszka | Jones, Skelton & Hochuli, P.L.C. 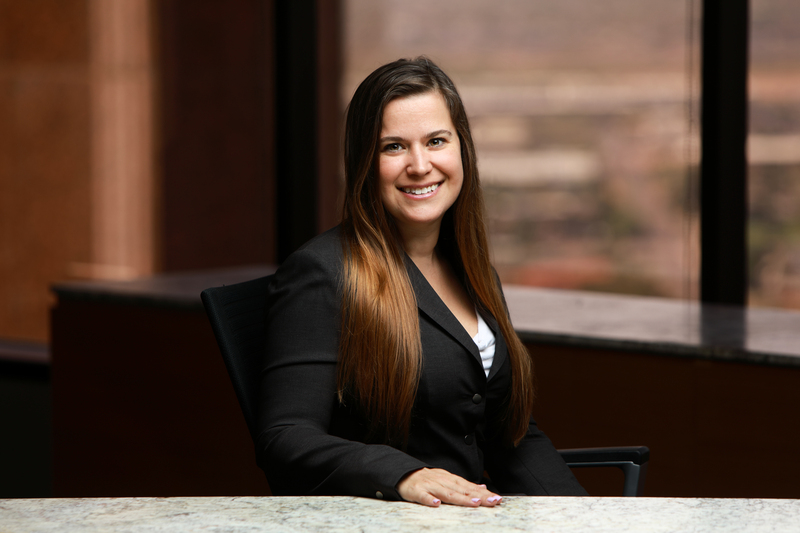 Cory Tyszka focuses her practice in the areas of medical malpractice and health care liability defense, products liability, and wrongful death and personal injury defense. She represents all manner of medical service providers—including hospitals, physicians and nurses—as well as pharmaceutical and supplement manufacturers. She built a solid foundation for her medical legal practice by earning B.A. in Biology from Wheaton College (MA). She continued her medical academic career in the Cancer Biology Interdisciplinary Program at the University of Arizona. Cory also has experience as a research technician at the Memorial Sloan-Kettering Cancer Center. While earning her law degree, Cory worked as an extern for the Hon. Donn Kessler of the Arizona Court of Appeals, Division One. After graduation, she served as a law clerk for the Hon. Rebecca White Berch, retired Chief Justice of the Arizona Supreme Court. Dedicated to helping high school students achieve their dreams, Cory worked to revive the Marshall-Brennan Constitutional Literacy Project during her first year in law school. The Project teaches high school students constitutional law and provides them the opportunity to develop oral advocacy skills. At the end of the year, the top four students travel to Washington D.C. to compete at Nationals and enjoy a tour of the city and the D.C. District Court. Cory continues to help fundraise approximately $10,000 per year to fund the Program and send students to Nationals in D.C.
Cory and another JSH attorney, Stephen Bullington, defended a an orthopedic surgeon against allegations of medical malpractice arising from a total hip arthroplasty procedure. During the 7-day jury trial, Plaintiffs alleged that Defendant was negligent by failing to repair an intraoperative femur fracture, failing to leave the prosthesis in proper anatomical alignment, and failing to recommend revision surgery, causing Plaintiff to suffer anatomical deformity, an inability to walk, and loss of employment. Defendant maintained that he met the standard of care in all respects, and that Plaintiff’s inability to walk was not caused by the surgery but was instead caused by pre-existing osteoarthritis, severe spinal stenosis, and Plaintiff’s failure to adequately engage in physical therapy. Plaintiffs claimed $429,000 in lost wages and at least $1 million in damages due to pain and suffering, loss of consortium, and loss of enjoyment of life. The case was tried in Maricopa County Superior Court before the Honorable Teresa Sanders. After deliberating for less than 45 minutes, the jury returned a defense verdict on December 5, 2018. Obtained defense verdict in 6-day jury trial involving home healthcare provider. Cory and another JSH attorney, Donn Alexander, represented a home healthcare provider against allegations of abuse, neglect, and negligence relating to the care of an elderly woman with dementia. Plaintiff alleged that Defendants’ caregiver employee was negligent in failing to respond to the elderly woman’s calls for help, causing the woman to fall and break her hip after she got up from her bed without assistance. Plaintiff further alleged that Defendants were negligent in failing to properly train and supervise the caregiver. Plaintiff also sought punitive damages. The Defense maintained that the caregiver’s actions were reasonable, that Defendants exceeded the standard of care in training and supervising the caregiver, and that the woman’s fall was not caused by Defendants’ or the caregiver’s conduct. Plaintiffs claimed $877,874.64 in damages due to pain and suffering, medical bills and expenses, and loss of enjoyment of life. The case was tried in Maricopa County Superior Court before the Honorable Rosa Mroz. After a 6-day trial, the jury returned a unanimous defense verdict on January 30, 2018. Cory and another JSH attorney, Cristy Chait, defended a physician against allegations of medical malpractice arising from an endoscopic procedure. The Plaintiff alleged that the procedure was not indicated and that Defendant was negligent in performing the procedure while Plaintiff remained on Plavix, causing Plaintiff to suffer a severe internal hemorrhage and associated complications. Defendant maintained that he met the standard of care in ordering the procedure and continuing Plaintiff’s Plavix. Defendant further claimed that Plaintiff’s alleged ongoing damages were caused by preexisting conditions. Plaintiff claimed approximately $1,000,000 in damages due to pain and suffering, loss of consortium, loss of enjoyment of life, medical bills, and expenses. Cory and another JSH attorney, Steve Bullington, represented a physician in this medical malpractice case arising from a penile prosthesis exchange procedure. Plaintiff alleged that Defendant was negligent in leaving a fragment of tubing from the removed prosthesis in the Plaintiff’s groin area, causing Plaintiff to suffer an infection, additional surgeries, and loss of employment. Defendant maintained that he met the standard of care in removing the prosthesis and that Plaintiff’s infection was not caused by the fragment. Plaintiffs claimed $900,000 in damages due to pain and suffering, loss of consortium, lost wages, loss of enjoyment of life, medical bills, and expenses. Obtained summary judgment on record in favor of client in a Section 1983 case. Cory and another JSH attorney, Brandi Blair, represented a correctional health care provider in this Section 1983 case. Plaintiff, who suffered from major prostrate issues, alleged that he had been denied necessary medical care while incarcerated. Cory and Brandi won the motion for summary judgment on the record alone. Plaintiff appealed, and the decision was upheld in the Ninth Circuit. While earning her law degree, Cory was awarded CALI Excellence for the Future Awards in four of her courses: Appellate Advocacy, Advanced Torts, Professional Responsibility and Writing for Law Practice. She was also a Willard H. Pedrick Scholar. “Tumor-Derived Chaperone Proteins as Anti-Cancer Vaccines in Multiple Modality Cancer Therapy,” Co-Author, Proceedings of the American Association of Cancer Research, 42:970, 2001.